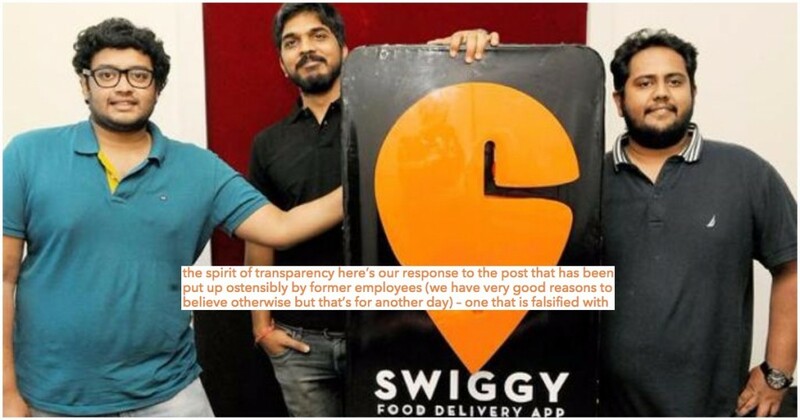 Swiggy has responded strongly to some of the accusations in the anonymous blogpost that went viral today morning, but its rebuttal hasn’t been complete — it has glossed over a glaring issue. Earlier today, a blogpost claiming to have been written by former Swiggy employees had gone viral. It had accused Swiggy of making its sales representatives lie to restaurants, promoting an unhealthy work culture, and most seriously, fudging its orders data while raising money from investors. Swiggy has now gone on and written a lengthy blogpost of its own, in which CEO Sriharsha Majety responds to all the accusations. Majety prefaces his response by calling the viral blogpost “ostensibly” written by Swiggy employees, and saying that the company has “very good reason to believe otherwise.” Now Swiggy has several competitors in the food tech space, and if the company says the post wasn’t written by former employees, it could be hinting that it’s the work of a rival. Majety then addresses the most serious part of the blogpost — the fudged numbers. He points out a discrepancy in the numbers between the excel sheet and the investor deck where the numbers in the two don’t seem to match. “The excel sheet screenshot is a complete fabrication,” says Majety. For good measure, he shares screenshots from Swiggy’s own internal dashboards that seem to back up their investor deck. Majety also adds that their numbers were verified by external consulting firm before their fundraise, and as such can be trusted. He then addresses other points in the anonymous blogpost — as for the accusation about cheating restaurants, Majety says that Swiggy never broke any contract, and restaurants would partner with them only if they saw value; as for lying to the media, Majety says they were talking about a 4 million monthly orders run-rate, not the actual orders; and for the accusations about the exodus of employees, Swiggy says they left over a year-long period under normal circumstances. The arguments are convincing, but Swiggy appears to have skirted a major issue in the viral blogpost — fake reviews. “We cheat our users,” the authors of the original blogpost had said. “Did you know that most of the good reviews for Swiggy on the app stores are planted and paid for? Also, on social media, genuine reviews (which are usually bad) get immediately removed and buried since they are mostly negative,” was one of the paragraphs. Swiggy’s rebuttal claims to cover all bases. “Now, here’s our paragraph by paragraph response to the post,” says Majety in his post, but mysteriously, the paragraph about the fake reviews is missing. The issue about the fake reviews left unaddressed. There are murky waters, and things at Swiggy might not be black and white, but some shade of grey. And Swiggy has further confounded matters by saying it has “good reason” to believe that the post wasn’t written by its employees at all. And while we’ve again contacted Swiggy to ask if they have a comment on the fake reviews, one gets the sense that this story is far from over. Update: Swiggy has a to-the-point response to our question around fake reviews. “All review on the app (both good and bad) are from consumers, and we do not partake in placing or planting fake reviews,” said a company spokesperson.